Tells you how to behave	inside the boundaries in order to be successful. A paradigm shift: a change to a new game, a new set of rules. Dentistry has been a very traditional profession with a long-established paradigm where the rules of the game have changed very little over the past 100 years. Accepted practices of dentistry, with little or no scientific basis, have been and continue to be taught in dental schools and continuing education programs. This has had an unfavorable outcome on the level of dental health care, perceptions of what is needed in order to maintain dental health and what insurance companies will cover for their participants. For instance in the 1960s, the original Crest toothpaste advertising campaign promised healthy teeth if one would brush twice a day with Crest and see their dentist twice a year. This advertising slogan became part of the dental paradigm, accepted as scientific fact without any research to test the validity. Dental insurance companies subsequently established a policy to cover teeth cleanings twice a year. The scientific truth is some people do not need two cleanings a year while others would be better served by having their teeth cleaned four times a year. The best cleaning interval depends on your risk for disease. At the Kois Center, we are not constrained by dental philosophies and practices just because they were taught to us years ago. We are committed to learning, growing and getting better for our patients and their care. All dental practices and procedures are questioned as to their purpose; the rationale and basis for their use are continually being examined. We are willing to build a bigger box—or even throw away the box—if science and treatment in the best interest of our patients calls for that action. 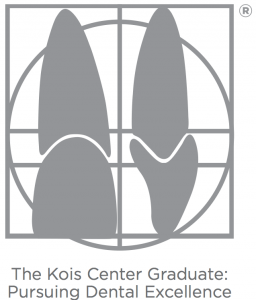 In this manner a Kois Center Graduate is at the forefront of technology and knowledge in terms of diagnosing and treating patients with the most up to date and predictable procedures and technologies.